What is the Paleo diet? This world-famous diet has helped tens of thousands of people transform their life from unhealthy to super fit. The goal of the Paleo diet is to adhere to a diet similar to what our ancestors would have eaten. This diet is not for everyone, but the results are enough to sway even the most diet-resistant person. Let’s dive right into the meat of the subject with our beginner’s guide to the Paleo diet. There was a time when supermarkets didn’t exist and people had to live off of the land. The idea of going into the grocery store and picking up an orange, especially during off season, was simply impossible. As the convenience of transportation has allowed people to get any type of food that they want, whenever they want, this has also caused the body to react in a less-than-favorable way. Effectively, the idea is that since we do not live as we should in nature, our bodies are beginning to breakdown, become weak and ultimately become riddled with sickness and disease. The ultimate goal of this diet is to eliminate grains, dairy and processed foods to help combat these growing problems. What are the Paleo Diet Guidelines? Paleo diet 101 should include all of the rules that you must follow. I will be honest, some of these rules will be tough to adapt to at first, but you will find that the results are worth the initial sacrifice. Portion control and calorie counting is not recommended. Eat foods high in fat. Eat moderate amounts of animal protein. Eat low to moderate levels of carbohydrates. Moderate amounts of fruits and nuts should be consumed. Remove legumes and cereal grains from your diet. Remove vegetable and hydrogenated oils from your diet. Do not drink liquids containing sugar. Remove most, if not all, dairy from your diet. There are also a few tips that you will want to adhere to before buying your week’s supply of food. Buy lean, pasture raised meat when possible. Organic fruits and vegetables are ideal. Frozen is okay. Eat only when you are hungry. You do not need to adhere to the normal 3 meals a day schedule. Sleep at least 8 hours per night. Exercise is allowed, in fact, your overall fitness and health will be greatly improved by adding workouts and activities to your daily life in combination with eating Paleo. It is also recommended that you go out of the house, enjoy yourself and ultimately live a happy life. This is a lifestyle change as well as a diet that will help you look and feel better than ever before. What is a Normal Paleo Diet Meal Plan? You are probably wondering what exactly you will be able to eat. Thankfully, all of the Paleo diet recipes I have ever seen are tasty and allow for a variety of meal options. Your Paleo Diet Meal plan should always begin with healthy, natural foods.The listing below is far from comprehensive, but these guidelines will get you on the right track. A good rule of thumb is to shop for items with the lowest amount of ingredients, look for 1 ingredient items, such as fruits, nuts, vegetables, fish, lean red meat, and chicken and you will be well on your way to eating healthier and the Paleo way. This Paleo cheat sheet will help guide you as well. Also be sure to shop the perimeter of your super market and steer clear of so-called health foods that are loaded with all sorts of odd ingredients. The best part is that there are thousands of recipes that you can choose from. You don’t need to be rigid in your food choices and you will be able to interchange meals. If you feel like eating beef tacos for breakfast or leftover chicken, this is allowed. If you want to have scrambled eggs for lunch or dinner, no one will mind. In fact, this is one of the most freeing diets in terms of flexibility. You are allowed to eat and do what you want, but you are limited with the actual types of food you eat. Where Do I Begin With Paleo? We often found that you have to begin slowly by forging your diet plan for the week. Do not expect to go to the store without some type of meal plan and last the week without ordering takeout. Ideally, you will mix in recipes that force you not to cheat. A delicious lemon chicken dinner with mashed sweet potatoes is just one of the many mouthwatering dishes that kept me from cheating when first trying the Paleo primal diet. Our beginner’s guide to the Paleo diet is just the beginning of what you need to know to really benefit from this diet. Are You Ready To Get Healthy And Start Feeling Great? If you are interested in trying this diet and want to get started right away, we highly recommend the Paleo Grubs recipe book. The book covers everything from basic nutrition, to foods you can eat, foods you are not allowed to eat; and a ton of recipes to help you along your journey. The entire Paleo lifestyle is also explained within this must-read guide. They claim its the only Paleo book you will ever need. I have a few Paleo books on my shelf that are great resources, but Paleo Grubs is my go to resource because its so easy to follow and the recipes are nothing short of top-notch. 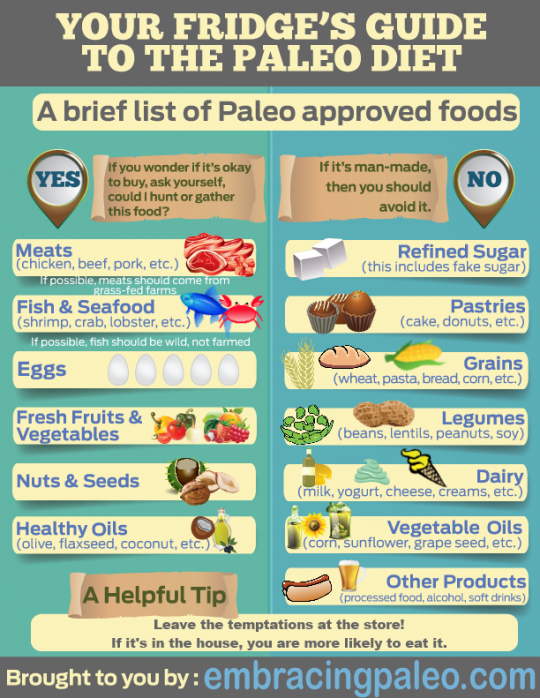 You Might Also Like: Check out this list of Top Benefits of the Paleo Diet Here.